Casey Cook is an artist and musician currently in Saint Barth to make art in conjunction with The Red Sand Project and Valentine De Badereau Gallery. 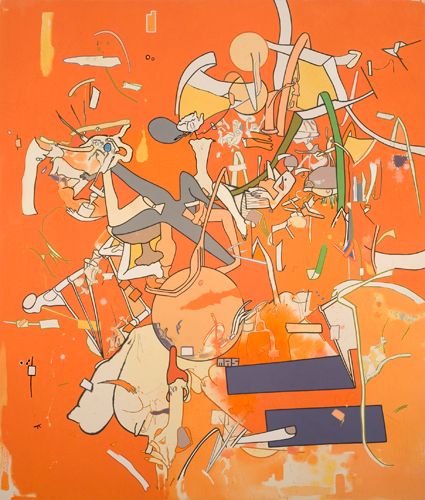 Cook’s most recent work is comprised of acrylic paintings and works on paper. Her paintings are compositions of geometric shapes and delineated figures that build toward enigmatic and balanced abstract constructions. At times carnivalesque and at other times sedately formal, the surfaces of her painting intimate the often indecipherable nature of desire. The paintings alight on this soft threshold. Impossible objects meet familiar ones, and perspective is dismissed, leaving the viewer at the mercy of the artist’s visual lexicon. Casey Cook received her BFA from the Otis College of Art and Design in Los Angeles and earned her MFA from the University of California, Los Angeles in 1997. Cook had a residency at Internationale Cite des Artes in Paris in 1998. Her most recent solo show was at 1-20 Gallery in New York City, October 2010. She has had solo exhibitions at Lehman Maupin Gallery and has participated in numerous group exhibitions. Cook lives and works in Chapel Hill, North Carolina and is the co-founder of the band Americans in France. As part of The Red Sand Project Cook is excited to create art in a new environment. She wants to explore the setting of Saint Barth and see how it may be reflected in her work. Along with painting, she creates videos, films, and sculptural installations.